Bringing more than five tons of supplies and equipment, the shuttle Atlantis closed in on the International Space Station early Sunday, on course for the shuttle program's 37th and final docking since the lab's assembly began in 1998. Around 6 a.m., one of Atlantis' four general purpose computers -- GPC-3 -- inadvertently shut itself down during a "wakeup" procedure, and flight controllers told the crew to press ahead without it. As it turns out, GPC-3 experienced a similar shutdown during a 2008 flight. "It turns out we have seen something like this fairly recently on (shuttle mission) STS-122," astronaut Steve Robinson radioed from mission control. "I don't know what you want to make of the common factors, but it was the same orbiter, the same GPC and the same MS-2." He was referring to mission specialist No. 2, Rex Walheim, one of Atlantis' four current crew members. "Yeah, Rex was telling me the story," commander Christopher Ferguson replied. NASA mission control commentator Rob Navias said the loss of one general purpose computer would have no impact on rendezvous and docking. "GPC-3 told itself to turn itself off, basically, at the time we were going into what is known as a set expansion for the rendezvous," he said. "This is when all the computers are brought up ... in support of the rendezvous activities. The switch detent that this GPC runs under thought it went into a halt and shut itself down. It will not be put back into the set of GPCs until once we dock to the International Space Station, and likely will not be recovered until Monday morning." The terminal phase of the two-day rendezvous was scheduled to begin at 8:29 a.m. EDT (GMT-4) with a rocket firing to begin closing the final eight nautical miles to the lab complex. Approaching from behind and below, Ferguson plans to pause briefly about 600 feet directly under the space station, guiding Atlantis through a computer-assisted back flip maneuver to expose heat shield tiles on the belly of the orbiter to cameras aboard the station. The lab crew, using 1,000-mm, 800-mm and 400-mm telephoto lenses, will photograph the heat shield in exquisite detail, then downlink the digital images to NASA's Damage Assessment Team at the Johnson Space Center in Houston. The dramatic rendezvous pitch maneuver, or RPM, is a standard post-Columbia procedure to help analysts make sure the shuttle's heat shield came through launch in good shape and is up to the rigors of re-entry. The RPM imagery will be combined with ascent photography and radar data, along with readings from impact sensors and the results of laser scans of Atlantis' nose cap and wing leading edge panels that were collected Saturday to provide a detailed assessment of the heat shield before Atlantis is cleared for entry. With the RPM complete, Ferguson will guide Endeavour up to a point about 300 feet directly in front of the space station with the shuttle's nose pointed toward deep space and payload bay docking module pointed toward the lab's forward port. "And then commander Chris Ferguson will guide Atlantis to her final approach and docking with the ISS," said shuttle Flight Director Kwatsi Alibaruho. "Again, with a reduced crew (of four), the deployment of the crew in the cockpit will be a little bit different, but they've been able to get a good flow and we've rehearsed this rendezvous scenario several times with the crew and we are excited to engage in this final rendezvous with the International Space Station. It'll be a great day, and I think we'll get some great imagery of the shuttle on its final approach." Waiting to welcome Ferguson, Walheim, pilot Douglas Hurley and Sandra Magnus aboard will be Expedition 28 commander Andre Borisenko, Alexander Samokutyaev, Sergei Volkov, Ronald Garan, Michael Fossum and Satoshi Furukawa. "This is the 37th flight of a shuttle to the space station, and the first flight was back in 1998 when Endeavour delivered the first U.S. element and attached it to the first Russian element that had been launched," said station Flight Director Chris Edelen. "So here we are 13 years later, the space station is now over 900,000 pounds, it's bigger than a football field from end to end, it's home to a multi-national crew of six doing cutting edge research in biology and medical science, astronomy, physics, fluid and materials science. "Space station largely has been lifted into orbit by the space shuttle," he said. "It's been assembled by spacewalking crews from the space shuttle and its been resupplied by the space shuttle over the years. 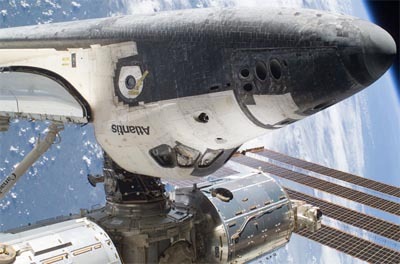 The space station literally would not have been possible without the contribution of the space shuttle." But keeping the station supplied after the shuttle fleet is retired will be a major challenge for NASA and its international partners. Two companies, SpaceX and Orbital Sciences, are building unmanned cargo ships to take over U.S. logistics deliveries after a series of test flights late this year and early in 2012. Atlantis' mission was added to the shuttle manifest earlier this year to deliver a final load of supplies and equipment as a hedge against problems that might delay the commercial cargo ships. The supplies and equipment delivered by Atlantis, along with provisions delivered by unmanned European, Japanese and Russian cargo ships, will support normal station operations through 2012. "The main purpose of STS-135 is logistics, bringing up supplies to provision the space station through 2012," Edelen said. "That's a key date because our commercial cargo providers are going to be coming on line in early 2012 and by providing the supplies we need to get through all of next year that will provide a little bit of breathing room as those companies enter the challenging flight test phase." After a brief post-docking safety briefing, the combined crews will get to work transferring equipment from the shuttle to the station and using the lab's robot arm to pull Atlantis' heat shield inspection boom out of the cargo bay so it can be handed off to the shuttle's arm. The boom is being moved to provide extra clearance when Atlantis' main payload, an Italian-built cargo module, is pulled from the bay Monday and attached to the forward Harmony module's Earth-facing port for unloading.